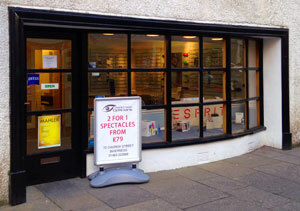 Hall and Fraser Opticians is an independent practice situated in Church Street, Inverness. We pride ourselves with providing a professional and friendly service at competitive prices. 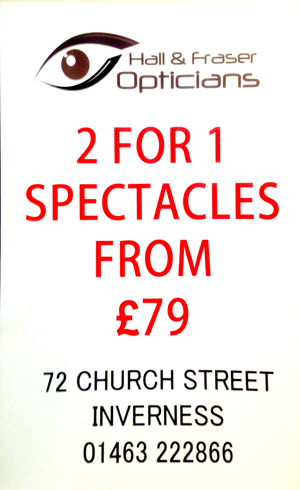 We have qualified professional staff and are able to provide all the aspects of eye care you require. Our optometrists will provide a thorough eye examination and discuss the needs you require whether it is spectacles or contact lenses this can be provided on site. At Hall and Fraser Inverness we have our own Glazing equipment and stock a large range of spectacle lenses so in many cases we can have your glasses ready within 1 hour if required. Our staff have all been in Optics for many years and have a variety of experience across the board so we believe this gives us the experience to deal with almost all situations and treat/refer appropriately as the situation requires.